After seeing Black Panther, tweet and tag @cuatower using the #untoldstories with ideas of superheroes or protagonists who need to have their story told. Marvel’s Black Panther is changing the way superhero movies are viewed and the impact they can have on relevant social and political topics. At a panel at Busboys & Poets in Northwest DC on Sunday, February 25th, the DC International Film Festival hosted David Betancourt, a reporter at The Washington Post, Dr. Jocelyn Imani, Curatorial Assistant at the Smithsonian National Museum of African American History and Culture; and Courtland Cox, Chair of the SNCC Legacy Project. The panel was styled as an open discussion covering everything from perceived plot holes to social and political ramifications. Until now, superhero movies have shied away from tackling heavy political topics, with one exception being Captain America: Civil War, which touched on the ideas of who should hold power and how much power in the government is too much. While these are important issues that need to continue to be discussed, Black Panther is a movie that forces society to take a look at black Americans and invites it to learn more, ask new questions, and begin a new narrative in our new generation. Hollywood has the reputation of playing the copycat game amongst itself. If one movie becomes an international sensation it is usually followed by a succession of similar films. With the release, and over 700 million dollar success, of Black Panther comes possibilities for more movies featuring strong African and African-American role models. If history repeats itself, we may be seeing more black American superhero movies and possibly even new black American heroes. Additionally, the fantastic cast, CGI, and script has the potential to inspire and promote black American art in our generation and for years to come. Even back in 1966, Jack Kirby and Stan Lee were trailblazers responsible for creating the first black mainstream superhero. 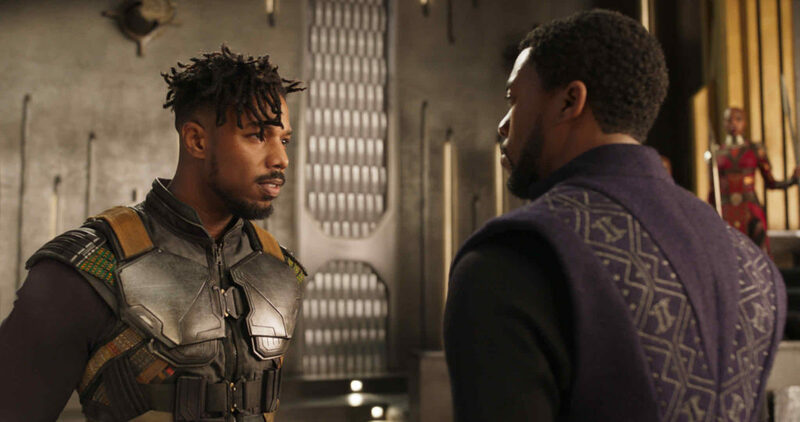 Now in 2018, their hero, guided by the expertise of director Ryan Coogler and the talents of Chadwick Boseman and the rest of the superb cast, is poised to open new opportunities for a more diverse Hollywood. The panel stressed that if we are making American movies they need to look like America and we need to be bolder about putting a spotlight on different cultures. Many cultures are dying within our mainstream, trend obsessed society. If Black Panther can make $700,000,000 worldwide, then that is sufficient proof that we can do more to support art and culture within black American communities. Who knows, maybe we’ll see some Asian or Native American superheroes next! The issue is not about making sure we have one superhero of every ethnicity, although representation is important, but that there is fair and equal representation in the media industry. The art of filmmaking is ultimately an art of storytelling, and the stories of people unheard and misrepresented are the stories that need to come out. We would be doing a disservice to the art if we left those stories untold. Black Panther is out in theaters already and is booming! After you see it, tweet and tag @cuatower using the #untoldstories with ideas of superheroes or protagonists who need to have their story told.